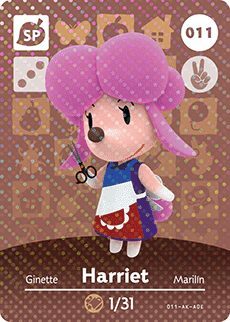 Spend lots of Bells at the Able Sister’s clothing store on Main Street in Animal Crossing: New Leaf, and talented stylist Harriet will eventually open a beauty salon upstairs. You can visit her whenever you feel like changing your hairstyle or colour, and frequent visits will reward you with extras such as coloured contact lenses. Her birthday falls on January 31st, meaning that her star sign is Aquarius.